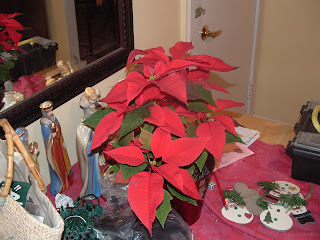 Here's my Birthday poinsetta. I sure do love plants. I kill them on accident regularly, but I do love them. I also got 3 nice candles from the kids, and a watch from Brent. We had my party on Monday night, because Tuesday (today) Brent had to work. Happy Birthday to Me! I'm now 31!